When life is busy and chaotic, settling in with a good book usually slows the world down and allows us to escape into imagination. 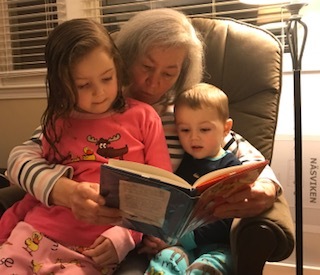 When the book is a children’s story, we share the experience with another, whether we are reading to a child, or the child is reading to us. And when the book is about a topic near and dear to one’s own heart, the reading is all the more enjoyable. There are many children’s books about the postal experience, and I have selected a few that are among my favorites. The first, Letters From Felix, by Annette Langen and Constanza Droop, features a lost teddy bear named Felix, who has great adventures as he tries to find his way back to his adoring human, Sophie. The book is not only a charming read, but also a visual delight. 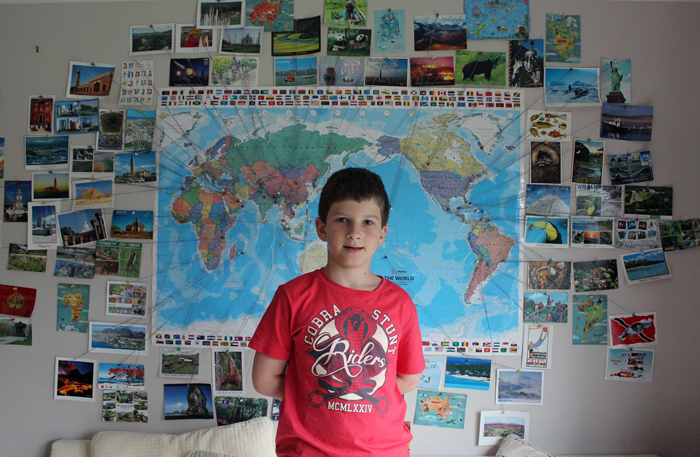 Felix writes letters to Sophie telling her where he is and what he sees at each location. And the book has the actual letters, in real envelopes! It is such fun to turn the page and find an actual letter your child can pull out and unfold and read. The letters always have an interesting tidbit about Felix’s current location and Sophie learns a little bit geography along the way. In The Day the Crayons Quit, by Drew Daywalt and Oliver Jeffers, Duncan goes looking for his box of crayons only to find a stack of letters from the crayons. Each letter expresses a need, like more variety in life or maybe more respect. The red crayon wants to do more than just color hearts and fire trucks. Beige seeks to be more than just “light brown.” And pink, well pink is tired of being considered a “girl color.” Duncan takes the letters to heart and we get a very happy ending. I Wrote You a Note by Lizi Boyd, Dear Panda by Miriam Latimer, Abuela’s Special Letters by Jacqueline Jules, and The Lonely Mailman by Susanna Isern, all tell stories about how letters connect us to the world around us in unexpected ways. The books are written for children but they will be enjoyed by anyone. My favorite of all the books I read for this post is Yours Sincerely, Giraffe by Megumi Iwasa. This is the tale of Giraffe, who wants to expand his horizons beyond his native Africa and decides to write to anyone who lives far away. Lucky for Giraffe that Pelican has just started a mail delivery service. As the story progresses we read about Giraffe’s concern about the letter arriving, and then his anticipation of what might be in the return post. Postcrossers will recognize those feelings! Giraffe’s letter ends up with Penguin, who lives in Antarctica. As the letter exchange continues, the fun begins. Imagine trying to describe something that your reader has never seen. Giraffe tells Penguin of his long neck. Penguin has no idea what a neck is, but with the help of Whale, they try to figure it out. The back and forth conversation via letters is both funny and thought provoking. And when Giraffe finally goes to visit Penguin, and decides to dress like what he imagines penguins look like… well, my grandchildren found it quite entertaining! What are some of your favorite postally theme books for children? Tell us in the comments! 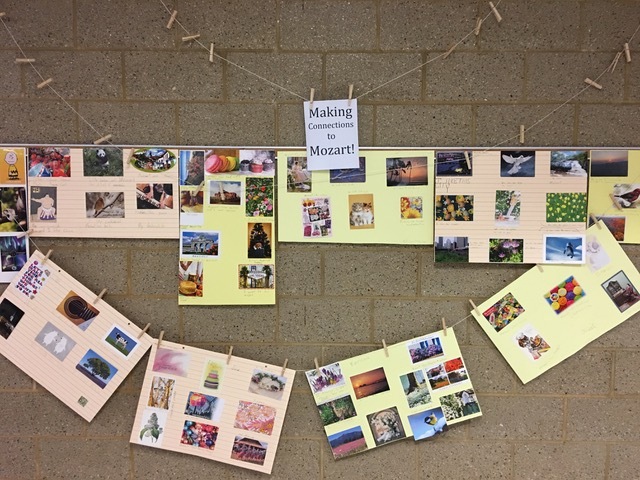 We’re always in awe of teachers and their innovative ideas for class projects involving Postcrossing. 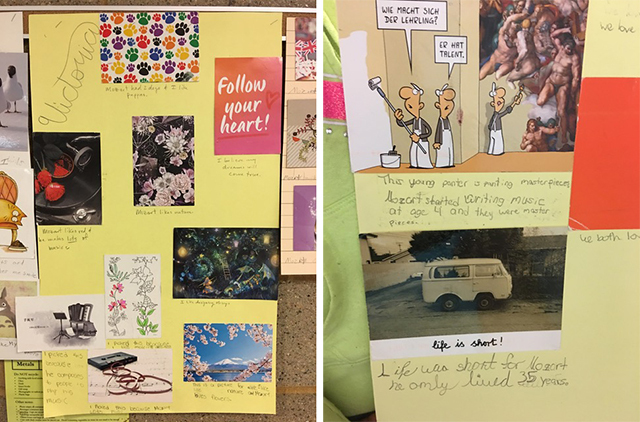 Sometime ago, we told you about this game of bingo from a Taiwanese school, and now Charlene (aka clbrown) from the USA wrote in to let us know of a project she’s been doing with her class, connecting their lives to Mozart… via postcards! Did you know, for instance, that Mozart called his wife "little mouse’, or that he loved the colour red and had a few red suits? What about the fact that he was an animal lover and kept several pets? 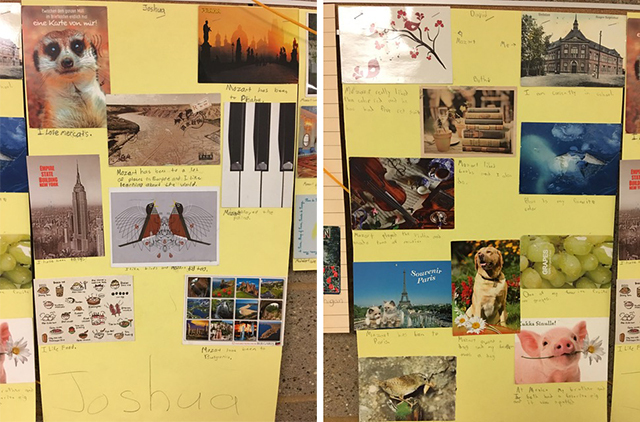 The results are great and they show a lot of meticulous researching, as connecting an Austrian composer to a random postcard takes some creative thinking! Turns out, we’re all humans in the end, so connections are inevitable, once you go looking for them. Well done children, and well done Charlene, for coming up with this imaginative activity! 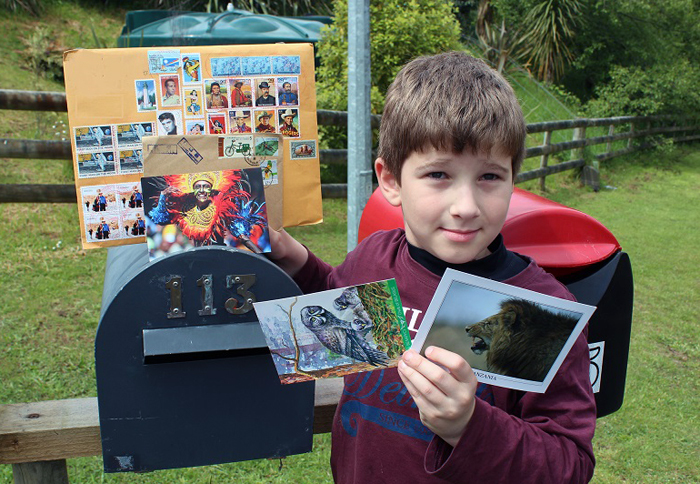 Postcrossing Spotlight: Zeby from New Zealand! 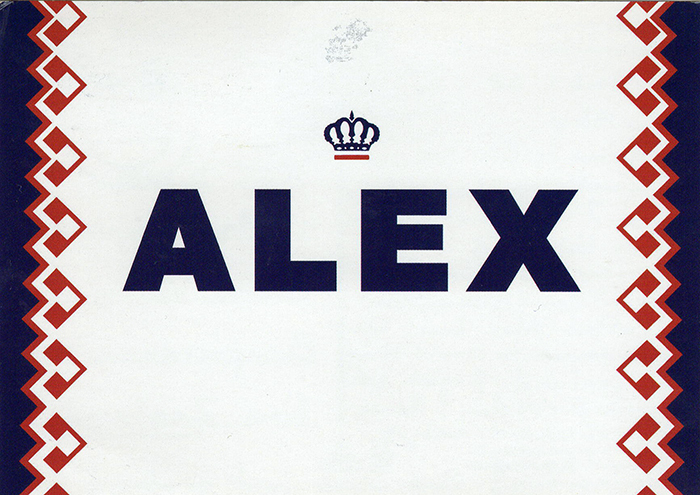 Hi Alex! 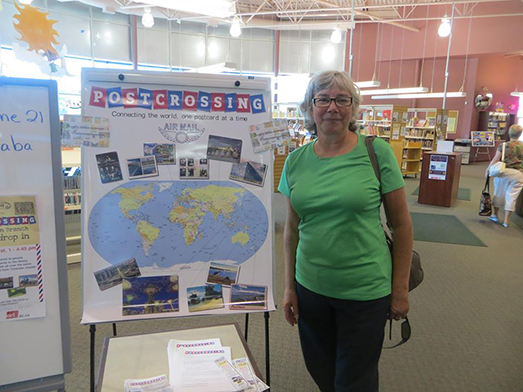 How did you come across Postcrossing? What got you hooked? My Mum found Postcrossing on the internet one day and thought it looked interesting. She had collected postcards when she was young and she thought I might like to have a new hobby. My brother had started stamp collecting and I wanted to do my own thing, I really like postcards and getting mail, so it was the perfect hobby for me. Postcrossing has been a great experience so far, it gets even more interesting each day. It gives me the chance to talk to people on the other side of the world. 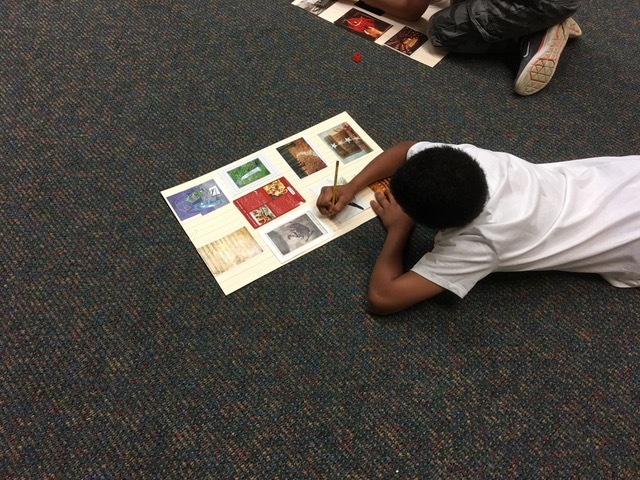 I get to learn about what creatures live in their countries, what their capital city is like and what their lives are like. I’ve joined in a lot of Round Robins on the Postcrossing Forum, it’s a lot of fun. From the Forum my brother and I have also got penpals our own age — it’s really nice to write cards and letters to other kids. I’m a Cub Scout. I love earning new badges, last year I earned 12 individual award badges. My twin brother and I got more badges than other Cub in the pack but it was a lot of work to get that many done in the year. 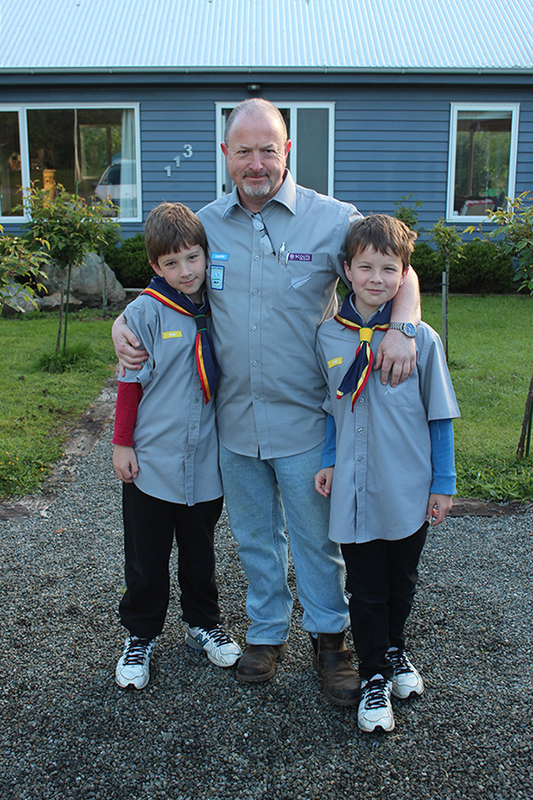 Dad joined Cubs as a Leader late last year too and we all went to the Cubs 100 Years Camp in November. My biggest hobby is reading. I love it. I read a lot, over 200 pages every night but Dad turns the light off if it gets too late. My favourite kinds of books are fantasy books. I got a lot of books for Christmas and I go to the library nearly every week. My letterbox is a long way away from my house, it’s a big rural letterbox and we don’t get mail every day in our valley. My postie comes in a van and sometimes I am at the letterbox waiting for him. He was very curious about all the mail I was getting so I told him about Postcrossing, he says I’m keeping him in a job with all my Postcrossing mail. 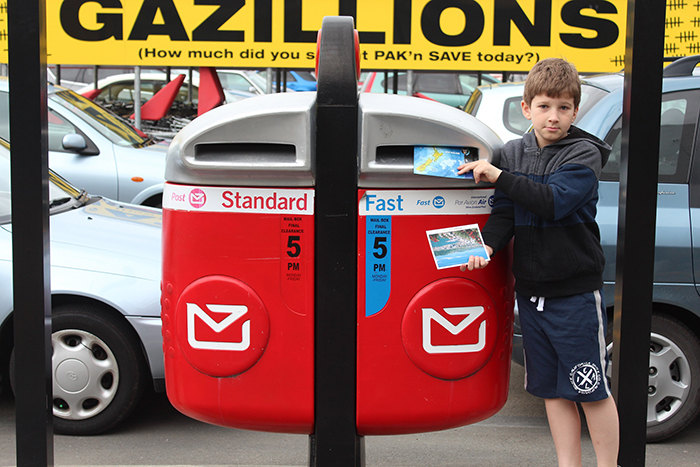 Here’s me at one of our local postboxes, I normally post my cards here as it’s outside the supermarket. I have a whole wall of cards on display. There’s one from each country in my collection pinned on the wall and I’ve got string leading to where it’s from in the world. My world map got too crowded so my uncle gave me a map of Europe. I swap cards around with my collection boxes and the wall. I have collections of native animals, native costumes, Cold War, volcanoes and space. My brother and I also have a box of Greetings From cards we are collecting. In my room I have my special owl collection on the wall. The house is covered in postcards! I’ve talked to my gifted education class about Postcrossing. They liked the idea and a lot wanted to join themselves. The teacher liked the idea too because it opens the world to classrooms. My Scout Pack Master loved my Postcrossing so much she joined. Dad says I talk to everyone I meet about Postcrossing. 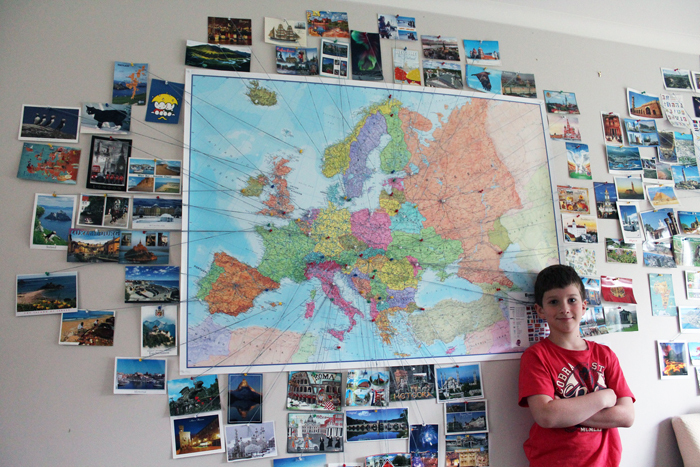 Everyone who comes in our house gets a tour of my Postcrossing maps! I like picking a new person to send a card to and then reading their profiles. I want to know about the people and match a card to them. It’s like a lucky dip, getting a new person. I enjoy sending cards out. Someone else sent me an official with my name on the front! 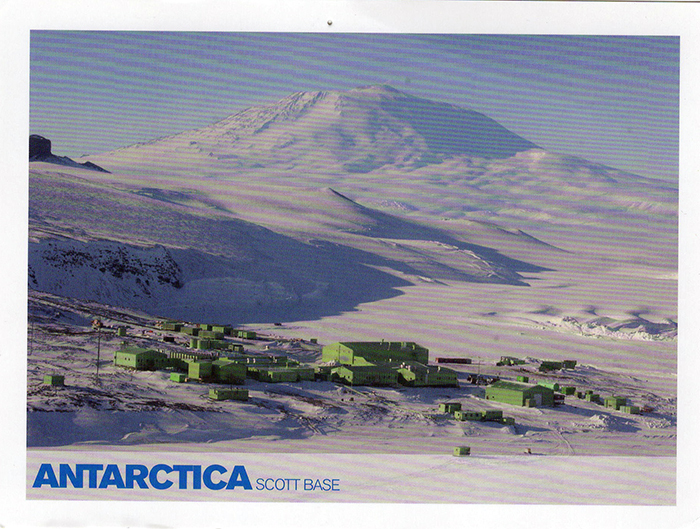 My favourite rare country was a card from Antarctica, though it didn’t come from Postcrossing. It was sent from a New Zealand scientist I met, she went down to Antarctica to do some field work this summer. Space is a big passion for me. My hero is Neil deGrasse Tyson, he’s an astrophysicist. I love astronomy and one day I’d like my own telescope to look at the stars. All science is amazing. I love learning, I want to know as much as possible. I like trying to learn languages. I like learning about history and how the world works. I’m lucky that I’m a worldschooler! Nothing melts our hearts like the happy combination of children and postcards. They might be young, but they can already appreciate the magic and awe behind these little pieces of paper! 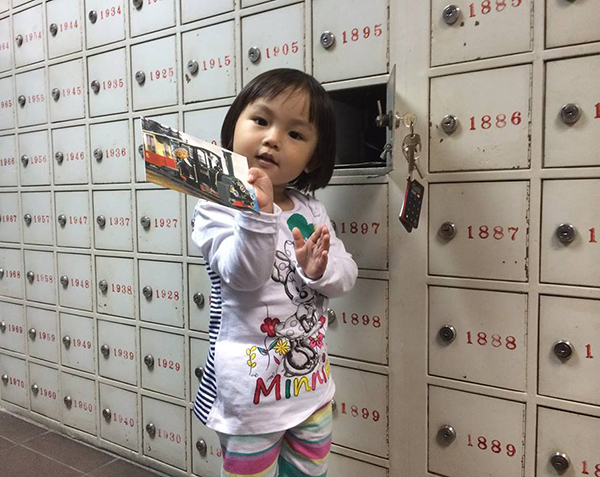 When Audrey was born, her dad opened her an account on Postcrossing, so that she could receive postcards from all around the world. 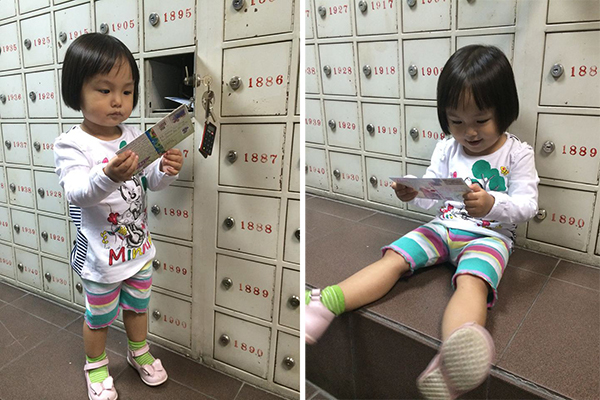 This was two years ago, and though she is still too young to read her postcards, she’s been enjoying Postcrossing in other, simpler ways. Doesn’t she look sweet? Alan says Audrey is excited to pick up her postcards from their post box and can even recognize the origin of a few of the cards she receives by the stamps she’s familiar with! Many nice people send her cards with all sorts of cute characters and animals, and often cover the back with stickers and drawings. What about you? 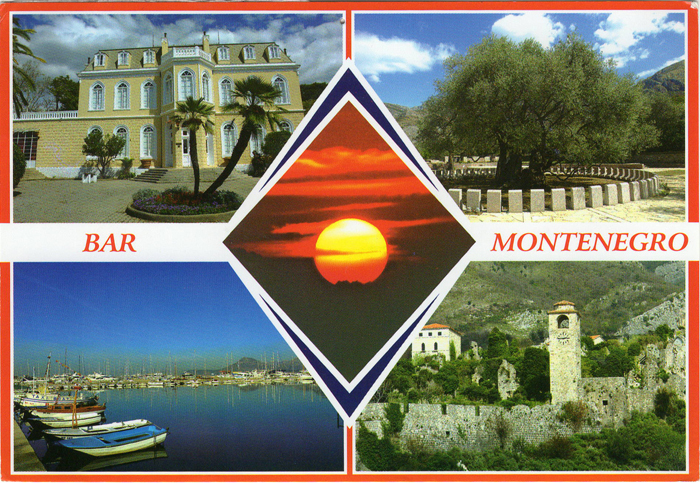 Did you ever share your postcards with your children or grandchildren? Leave a comment below – we’d love to hear about it! 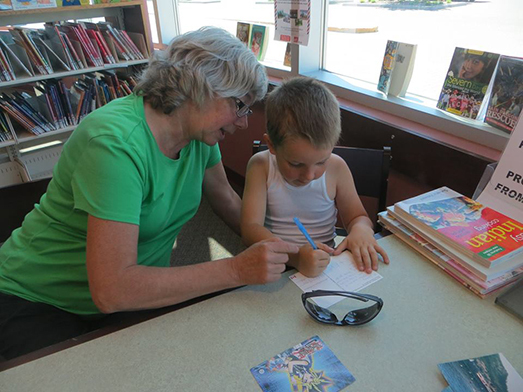 Postcrossing day at the Okanagan Regional Library! 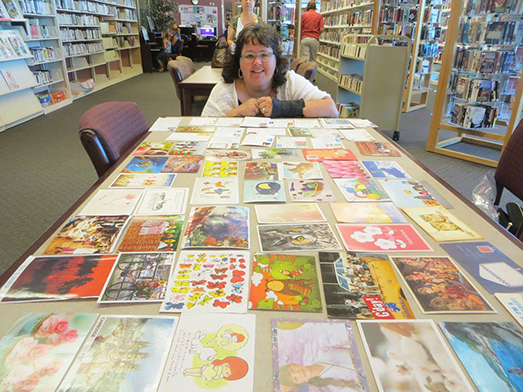 She put a post into the forums asking Postcrossing fans to send postcards to the library. 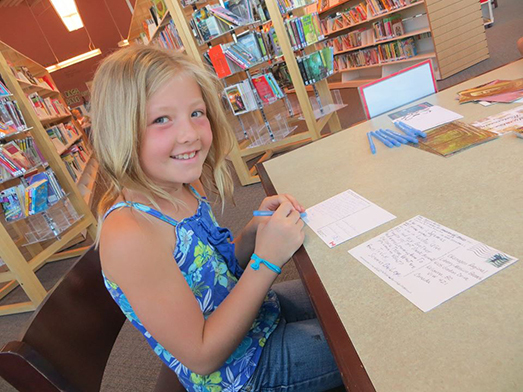 I donated 60 blank postcards to the library so children could answer the postcards. The library set up a wonderful display for one month to let people know about it. 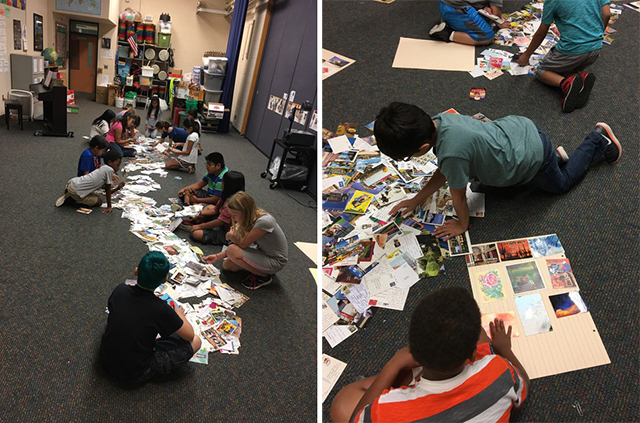 At last, the day for our Postcrossing-summer reading program project came… we arrived half an hour before and waited for the kids to come. It was so wonderful for the children to be able to pick the postcards they wanted, then write the sender a card in return. 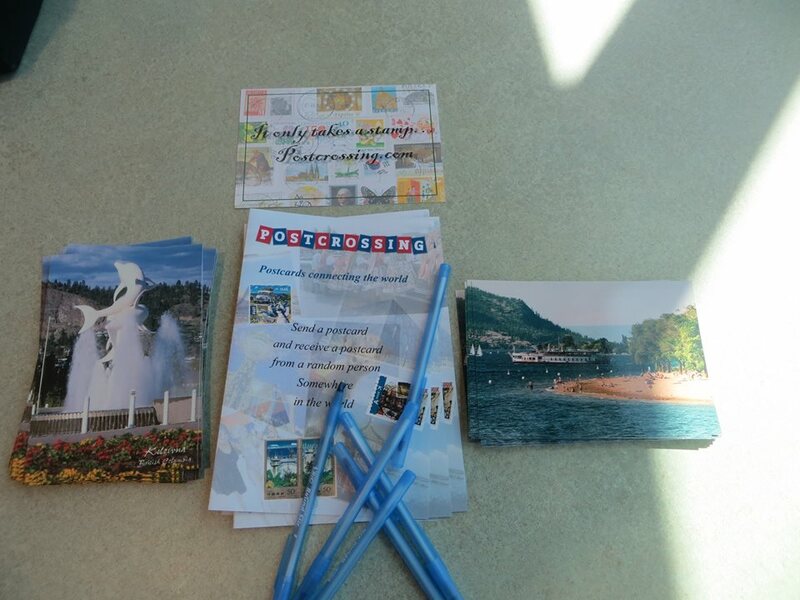 We had one sender who sent 8 postcards to the library! The children were very enthusiastic and had a wonderful time, there was even a parent who wanted to write a card too. Overall, our project was very successful and so much fun. I also took many of my favorite postcards to show the variety of postcards we receive and the wonderful stamps on them. It is so exciting to share our passion with others! We have a few extra postcards that were not answered, so I will be going to another library to see if they would like to continue the project! What about you? 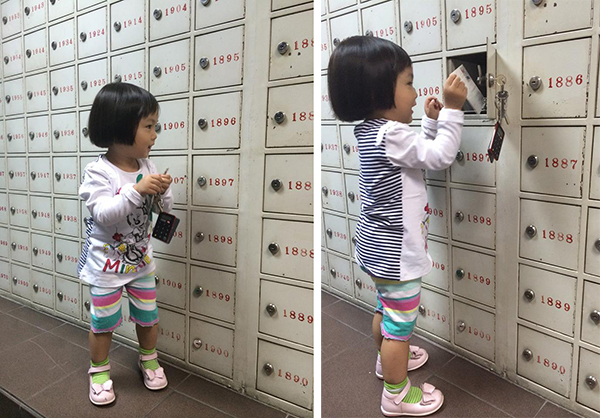 Have you ever introduced a child to the wonders of mail? Do share!